In the 1870s the house at No. 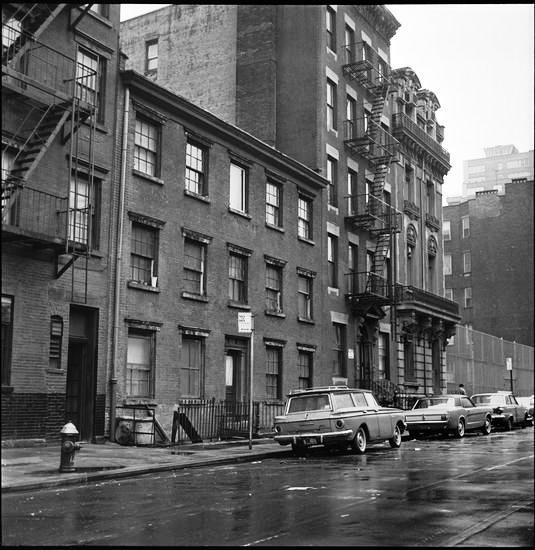 207 East 32nd Street, between Second and Third Avenues, was home to the Smith family. William Wickham Smith was a tutor and his daughter, Julia M. Smith, taught in the Primary Department of Grammar School No. 14. But a decade later, in 1888, the house was purchased by the Tammany Central Association. The group was incorporated that year by Richard Crocker, James P. Keating, and others, including three magistrates, Judge Pryor Surrogate Ransom and Justice Fitzimons. Tammany Hall was a powerful machine and no conflict of interest was noticed when the School Commissioner’s headquarters for charitable work operated from the 32nd Street house in 1894. By the turn of the century the old house was no longer suitable for the Tammany Central Association. On June 15, 1901 the Real Estate Record & Builders’ Guide reported that architect Robert T. Lyons had been hired to design a new clubhouse on the site. The $40,000 structure was completed in 1902. The 28-year old architect had produced a four-story brick and stone confection that pretended to be a French townhouse. A rusticated limestone base sat a few steps above the sidewalk and the stone stoop was flanked by two cast iron lampposts. A stone balcony stretched the width of the second floor, matched by another at the fourth floor. Two elaborate dormers gushed through the mansard roof. On the top floor was the apartment of Edward J. Sweeney and his wife, Mary Frances. 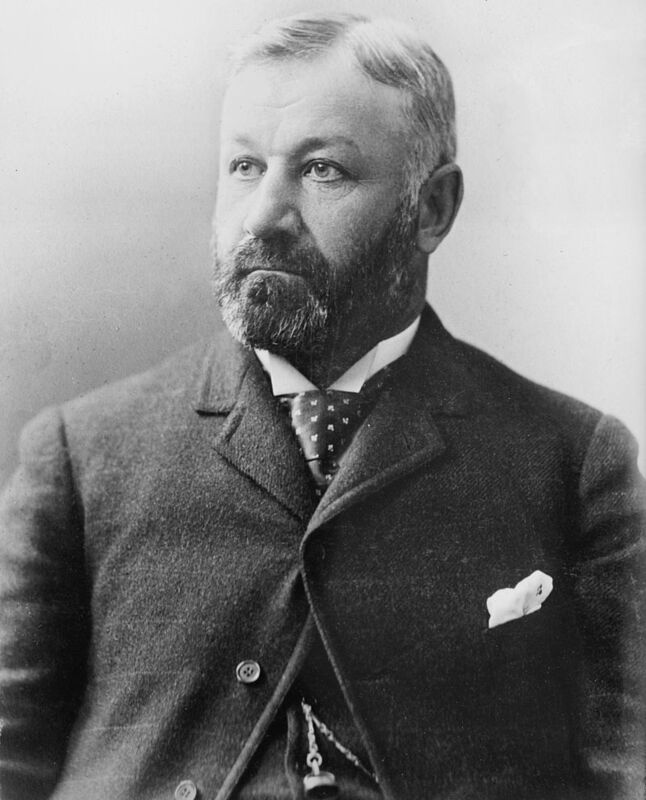 Well-known to New Yorkers, Sweeney had been the club’s superintendent since 1894. Born on the Upper East Side in 1866, his father was a celebrated bare-knuckle boxer who went under the ring name of “Charley” Holmes. Edward Sweeney had also taken to the ring, becoming a star featherweight boxer. He trained other fighters, including John L Sullivan. In 1884 Edward Sweeney and his had father had opened the highly-popular Sweeney’s Hand-Ball and Racquet Courts on East 35th Street. By the time the doors were opened Richard Crocker’s star had faded. The failure of his mayoral candidate, Edward M. Shepard, to be elected in 1901 was the last straw in disappointments to the party. Crocker resigned from Tammany leadership. Thomas Murphy became the “executive member” of the Tammany Central Association. But social groups, religious leaders and newspapers, indignant over the graft and corruption enjoyed by Richard Crocker and his cronies, demanded change. The dramatic collapse of Tammany power was evidenced in W. Bourke Cockran’s address in the 32nd Street clubhouse on February 1, 1904. On Saturday February 9, 1909 Edward J. Sweeney died in his apartment on the top floor at the age of 43. His funeral was held in the clubhouse on February 16. The passing of Edward J. Sweeney was almost symbolic of the passing of the old days of the Tammany Central Association. Infighting was such that when an election was held here for the leadership of the district on July 30 that year, threats were made and security was tight. The New York Times called it a “stormy meeting” and noted “every man’s credentials were carefully scrutinized before he was allowed to enter the room.” William A. Larney, Secretary of the Fire Department, was not listed as a nominee and the irate politician not only refused to vote, but addressed the assemblage with threats. The Tammany Central Association would not be in its clubhouse for much longer. On July 1, 1901 the Record & Guide reported “The old 18th District Tammany clubhouse at 207 East 32d street, in which Crocker got his first start in politics, will cease to exist as a political headquarters after this week.” The organization had leased the building to the Yorkville Municipal Court at an annual rental of $4,000. The former clubhouse would be leased as a courthouse until 1939. During that time cases both mundane and sensational were heard. In 1923 Charles B. Manville, the 90-year old founder of Johns-Manville, Inc. defended himself here against Dr. Alonzo Eugene Austin’s $21,000 suit. The bizarre case began when Manville visited a spiritualist, Beulah Thompson, after he heard she had given “profitable stock tips” from her crystal ball to Charles M. Schwab and other moguls. Manville testified that Thompson, who The New York Times described as “a blonde, slender woman in the thirties,” performed a séance in “a cabinet” in her home, during which his dead wife’s voice was heard calling him “C. B.,” her pet name for him. And so he did. And he convinced Dr. Austin to give him $21,000 to invest in the mining company. Now the elderly executive had the embarrassing task of publicly discussing his reliance on spiritualism. Beaulah Thompson, incidentally, testified that she gave Manville no stock tips at all, and that he came to her to cure his insomnia. Another sensational case occurred in December 1934 when two New York City Nazi groups battled it out. 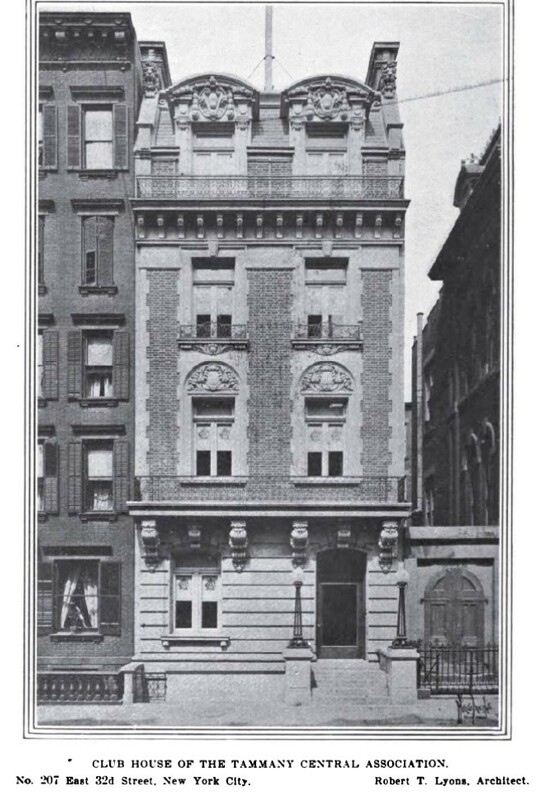 Dr. Hubert Schnuch was president of the League of Friends of New Germany and had founded the Deutscher Beobachter, a newspaper called the “mouthpiece of Nazidom in America.” But Anton Haegele who signed the lease on the newspaper’s headquarters at No, 305 East 46th Street as an “agent” of the firm, then tried to take control and force Schnuch out. In 1939 the City announced that the Municipal Court would not renew its lease with the Tammany Central Association because it was moving “to more modern quarters.” The building was sold at auction in May the following year. In 1952 the old clubhouse was converted to offices. It was home to a “testing laboratory and office” in the cellar; and Slocum Fuller, consulting engineers, on the upper floors. That firm moved out in 1965. Here on the second floor New York magazine was founded by Milton Glaser and Clay Felker in 1968. Milton Glaser remains in the building in the form of W.B.M.G., Inc. (the initials of Walter Bernard and Martin Glaser), and Milton Glaser, Inc. Although the stoop with its cast iron lampposts has been removed, the old Tammany Central clubhouse is otherwise little changed. What has changed is the block on which it sits. The French townhouse is glaringly out of place next to a modern apartment building and a playground—the last remnant of a much different time on East 32nd Street. Have always admired this jewel definitely out of place here in the neighborhood. Could easily fit right in along any upper East Side mansion and be right at home.